Chantilly Grey will be hosting Shrewsbury Model Railway Show on Saturday 20th October 2018 from 10am until 4pm at the United Reformed Church, Coleham Head. This is the first show of its kind in Shrewsbury in many a year and is already very eagerly anticipated by local enthusiasts and those new to the hobby who want to pop along and hopefully catch the model railway bug! We are billing the event as a very family friendly orientated show. Admissions will be £4 for adults, £2 for children and under 5’s free! We will be offering guests the chance to win tickets leading up to the event, so please check our Facebook Page for details. The “Whistle Stop” Café will also be on hand to serve refreshments and a selection of breakfast and lunchtime faire. It will be a fabulous day out for all, a number of activities will be available for the young model train fan to entertain and our show guide programme will full of interesting articles and will make for a great read following the event. Guests will also get chance to enter our prize raffle and take part in voting for the ‘best in show’ layout. A brief history of Model Railways! The history of model railways is almost as old as railways themselves! Early models of the late 1800s and early 1900s were usually made from metal and as many homes did not have electricity at that time they were often powered by steam or clockwork mechanisms. We are lucky enough to be able to show you a tinplate clockwork layout at the show in October courtesy of Mick Woodman, a local model enthusiast. Some of the locomotives that you will see on his display date back to the 1930’s. In the early days of model railways, model trains were relatively expensive and only the wealthy, or at best, the moderately well off could afford them. Model railways for the masses became more common from the 1920’s with more affordable mass produced models being made available. It wasn’t until 1891 when German company Marklin launched the first complete system of trains, that we see the introduction of standard track gauges, ready to use track, and range of locomotives, rolling stock and accessories to compliment. This was a defining moment, as now users could have an initial train set, but could now continually add to it!!! This was of course good for the toy manufacturer, indeed this is possibly the first example of the expanding range, with items at various price points for Christmas, birthdays, parents and relations and pocket money sized, which is one of the basic features of most successful toys since. The model railway as we know it today was born and continues to be one of the most popular hobbies worldwide. 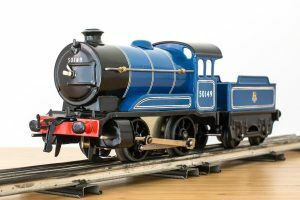 Lots of people get confused between scale and gauge when modelling model railways. The words scale and gauge seem at first interchangeable but their meanings are different. Scale is the model’s measurement as a proportion to the original, while gauge is the measurement between the rails. Scale is the relationship between its size and the size of an actual train. Usually measured as a ratio or as a millimetre to inch conversion. The Gauge is the difference between the inner edges of the two rails that it runs on. You will be able to see a variety of these on the day. All Exhibitors are very accommodating and will be delighted to talk to you about the layouts and also offer advise on building your own! We very much look forward to seeing you all there! Tagged: Chantilly Grey, model railways.